Free Range chicken and cauliflower nuggets with a crunchy panko crumb. These nuggets have been fussy eater approved making them suitable for the whole family. 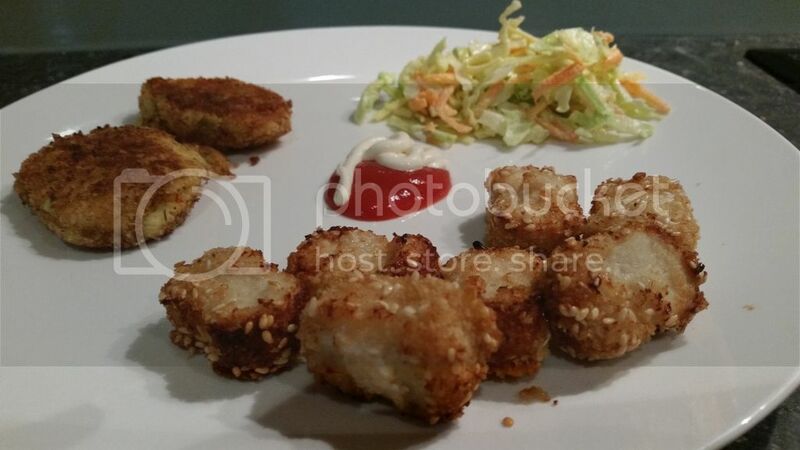 • Ingredients: Free Range Chicken Mince (50%), Cauliflower (30%), Panko Breadcrumbs [Wheat flour, Sugar, Salt, Yeast], Batter [Water, Cornflour], Sesame seeds , Canola Oil, Seasoning [Including Natural Vegetable Flavours], Garlic. My girls (7 and 8.5 years) love chicken nuggets and it is a regular part of our menu. Cauliflower however, my children regard as a garnish on their plate. 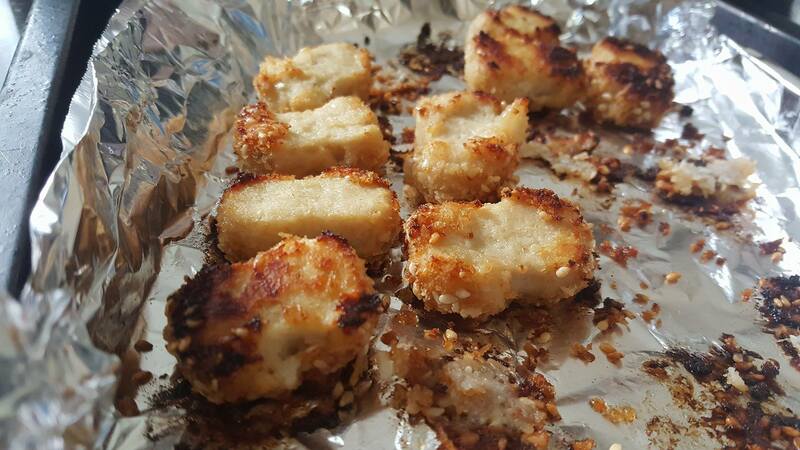 They refuse to eat cooked cauliflower so I was curious to see if Smugglers Chicken Nuggets with cauliflower hidden inside would be eaten by them. Of course I didn&apos;t tell them until after they had eaten it. The instructions were to cook for 15-20 minutes. At 15 minutes the chicken was cooked but the coating was still soggy. We were short on time so I dished the chicken nuggets up along with Smugglers Beef Nuggets, some tomato sauce and aioli. The nuggets we very hot so we had to wait a few minutes for them to cool down. Both girls ate a few chicken nuggets each and there were no complaints. To them it seemed like they were just eating regular nuggets. It wasn&apos;t until I told them that there was also cauliflower in the nuggets that they started saying they didn&apos;t like them. If they didn&apos;t like them they wouldn&apos;t have eaten several of them. What I liked best about these nuggets was that I could literally throw them in the oven and 15 minutes later have my kids eating meat and veggies. 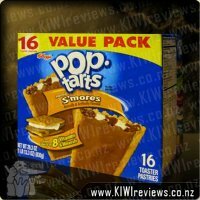 The price is more than I would pay but hopefully as the Smugglers become more popular and they are producing more they will become more competitive. It is certainly cheaper than what I would have to pay for the same amount of nuggets at McDonald&apos;s and I&apos;d have to leave the house for that. 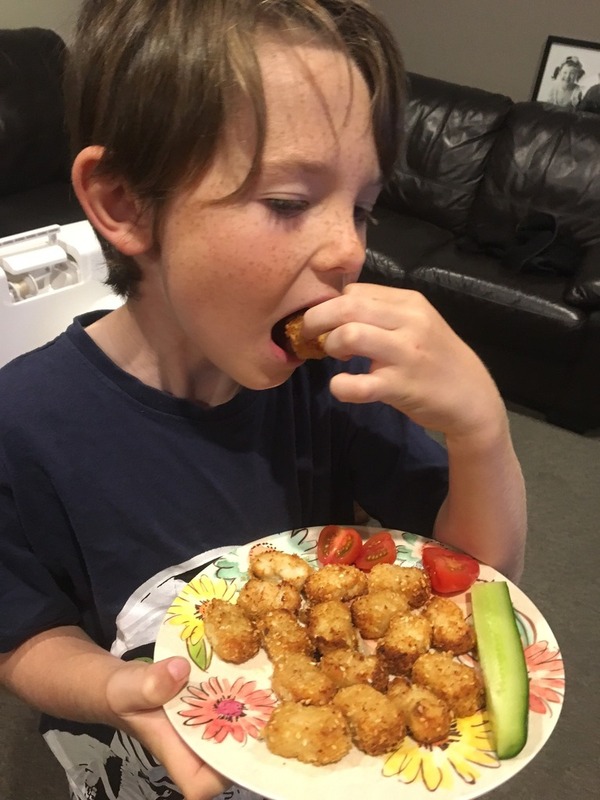 We don&apos;t eat a lot of nuggets at home, but Miss 8 is very familiar with them thanks to her occasional McDonald&apos;s treats so her eyes lit up as soon as she saw them. As I&apos;d normally do with this type of product, I completely ignored all the cooking instructions and chucked them in the rotating basket of the air fryer - usually the key to success. However not in this case - all the coating came off and stuck in the holes in the basket and burned, or fell right out of the basket. Although I was tempted to find some sort of edible glue to stick the coating back on, I just decided to serve my naked nuggets! Luckily I&apos;d only done half the box so I could try a better cooking method the second time. Anyway my naked nuggets went down a treat, but the lack of coating meant they were fairly plain and easily pretty child friendly. I read the box and couldn&apos;t work out whether I&apos;d inadvertently managed to get rid of the hidden cauliflower or if this is mixed through the chicken, and couldn&apos;t decide. Either way, my cauliflower-hating husband and daughter both ate them! I saved 3 nuggets to pop in Miss 8&apos;s lunch and these were a nice little treat, happily eaten cold and something a bit different for her. The true test came the next night when I cooked them as per the instructions - still using the air fryer, but on a rack as if it were an oven. The coating mostly stayed on and I was confident I had every last piece of hidden goodness to feed my daughter. Hubby and I had another taste test and I&apos;m happy to report that everyone still liked them. Even though the nuggets are all gone now, I haven&apos;t mentioned the cauliflower as I might want to buy them again and I&apos;m keeping that part my little secret! I actually personally could taste the cauliflower, but I love cauliflower anyway, and I have to say that the nuggets were beautifully moist. In summary, I&apos;m not a huge fan of serving my daughter something different from the rest of the family, but the box wouldn&apos;t be enough for the 3 of us to all eat it (2 adults and a child) so for me this is something I&apos;d serve only occasionally if I need to do a separate meal for some reason. Our box only lasted 2 nights and that&apos;s with padding them out with other things, so I would say a 2-child family would eat these all in 1 serving. To me that initially didn&apos;t seem overly economical but if I think about it - comparing it to takeaways then it&apos;s probably not so bad. And if I was serving up this sort of meal, I&apos;d much rather pay more and serve something that isn&apos;t full of additives and that has some veges included. So on this basis I might pop some more in the freezer for those just-in-case moments, and I can certainly recommend they pass the fussy taste test. 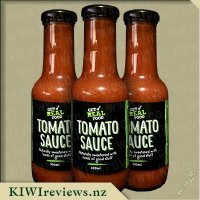 I have seen a lot of hype about the Get Real Food Smugglers on facebook of late and have been really keen to try them on my fussy kids who eat very minimal vegetables. Of course fussy kids will always eat chicken nuggets so what a great way of sneaking in some extra vegetables into their diet than with their favourite food. 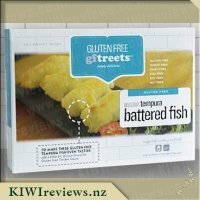 I know my children especially do not like cauliflower and even complain about the smell when it is cooking so I was a little careful to hide the packaging until they had tried them any mention of cauliflower and they would not of even tried. 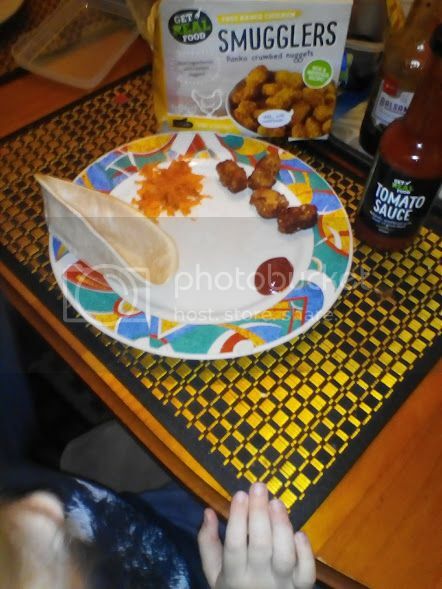 I made taco&apos;s in soft taco bowls for the family as you can see from the photo my 5 year old choose very minimal salad to have with his opting for the taco bowl a little grated carrot and the chicken smugglers. I watched as he ate his first chicken smuggler and was impressed that there was no complaining, he told me the chicken nuggets were very nice. My eldest had the same response, quite surprised by that as she can sniff onion out even when I have whizzed it up in the nutri ninja before adding to the meals. 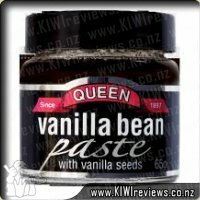 They both declared they were very yummy and could I buy them again! I got to try a very minimal amount because they argued over who was getting seconds so I was left with two for taste testing and I could see why they liked them so much. 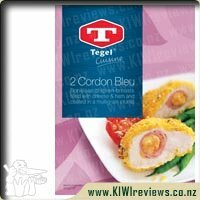 The inside is nice tender chicken breast that you can tell is real chicken not over processed chicken bits. I could not taste cauliflower at all even though I knew it was there. 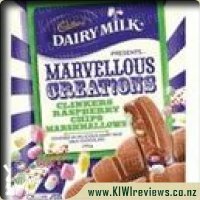 I loved the coating on these it was nice and crunchy a lot nicer than the crumbed nuggets I have tried in the past and would normally stay away from. I have since bought more for the children and although they are quite expensive relative to how many smugglers you get in a packet they are worth it. 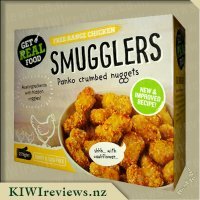 As I do not make nugget type meals often they are something I would buy again but they do only do one meal for the $10 price tag as opposed to a $10 bag of nuggets that usually come in 1kg packets that would last other a few meals. I think this is probably relative to the quality of the materials so like I said worth the extra just a luxury item in our grocery budget. 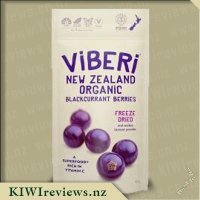 When my daughter picked up the packet and looked at the list of ingredients in this product, she immediately said that she would buy it again because it is nutritionally sound. She is quite fussy about the sort of meals she prepares for the family - they have to be wholesome as well as tasty. No junk food for her! And this was before we had so much as opened the packet. She also said her sister might like them too as the only meat she eats is chicken, and she sets similar high standards in the nutritional quality of the food she prepares for her family. We prepared them together, closely watched by the children - who adore chicken nuggets so could not wait to taste test these. Although the packet was quite big, there were not many chicken nuggets inside - certainly not as many as we had expected. However, the weight was the indicator so we should probably have looked at that rather than the packaging size. All the same, there were enough for the children to have a meal and the adults to take a couple each to try. Miss Five really liked the chicken flavour. We did not tell her that there were veggies hidden in there as well, and she did not comment on that so it must have worked! Mr Seven knew, of course, because he had read the packet, but he likes cauliflower so that was fine. He commented on the nice creamy taste where the batter outside joins the meat inside. He liked the contrast between the soft interior and the crisp outside, and said he could taste the sesame too. My own reaction was entirely positive as well. I liked the flavour, as did the other adults too, and like the children I could not actually distinguish the cauliflower flavour or texture at all. It hides inside the chicken! I have made white sauce in the past using blended cauliflower and soy milk instead of the usual flour and butter, and it absorbs the flavour of the herbs or cheese you then add. This version reminded me of that one - lower in fat but not at the expense of flavour and texture. 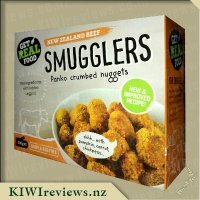 An interesting idea; smuggling veges in with meat nuggets. Children generally love nuggets and hate vegetables so what better way to ensure they get their nutritional needs. Except do they actually get their nutritional needs from it? 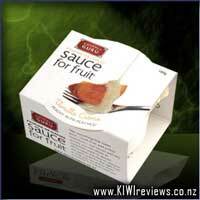 The packaging (which is lovely looking packaging) specifies that the package consists of around 17 servings. Counting what was inside, I had 18 nuggets, which means 1 nugget is 1 serving, which has 2.1g of protein. Not really anything substantial. In reality, you would need 5-7 nuggets per serving, or depending on the age of the child. I baked the entire box of nuggets, and the first thing I noticed was the smell. While a child may not be familiar with it, I could very easily detect the smell of cauliflower. The nuggets started of about two-thirds of the size of other chicken nuggets. The packaging simply says to cook from frozen by placing on a tray and baking. I placed the nuggets on tin foil, and placed them in the oven. When it came time to turn them over, I noticed that the coating had stuck to the foil, so I lost most of my panko crumbing before consumption could occur. I would definitely recommend using baking paper when cooking these to prevent them from sticking. Another unfortunate discovery was that the nuggets had unfortunately shrunk significantly while in the oven, so the nuggets must have a reasonably high water content. By the time the nuggets were cooked through, they were the size of the top segment/joint of my finger (maybe a quarter of the size of a regular chicken nugget. Taste-wise the cauliflower was indeed rather well hidden. While the nuggets tasted different to most chicken nuggets, it wasn&apos;t enough to be able to tell it was because of cauliflower (especially if they were dipped in a sauce). 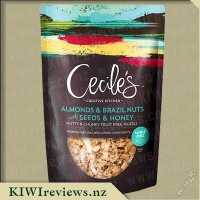 It was interesting to see that the product is dairy and egg free, and yet had sesame seeds in it, which is a much more common allergen, so something you most likely couldn&apos;t put in a child&apos;s lunchbox. 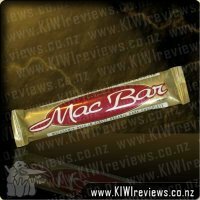 An interesting product, but the size of them is really their only downfall. 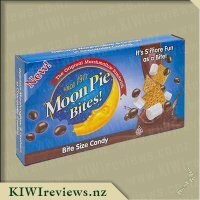 Far too small, which means you get far less servings per pack than advertised. What child doesn&apos;t love chicken nuggets? I know Miss 4 loves them and would happily devour a pile of them each day if she could, however let&apos;s face it chicken nuggets aren&apos;t exactly the healthiest food on the planet (perhaps up until now that is!) Upon returning home with a box of review goods Miss 4 was delighted to see that I had a box of chicken nuggets, so without any thought these were what we were to have for dinner that evening. Before cooking these up I was curious as to what ingredients these actually contained, I was impressed to see on the ingredients list that they actually were 50% chicken and 30% breadcrumbs and to see that the rest of the ingredients were in fact in the crispy panko coating, there were absolutely no hidden nasties, colours or preservatives which straight away gave them a huge thumbs up from me! It&apos;s always good to know that what you are feeding to your children (and yourself) is actually healthy and full of goodness. The nuggets were easy to cook by simply placing them onto a oven tray and cooking at 180c for 20 minutes, just requiring you to turn them once. Once cooked the nuggets, smelt delicious and looked amazing with their crispy golden coating. Taste wise these were awesome, a yummy moist chicken nugget with a delicious golden crumb, personally I could taste the cauliflower ever so slightly which didn&apos;t bother me at all, but the favourite part of the nuggets for me was the delicious crumb I loved the addition of the sesame seeds to it which made for an added crunch! My partner and Miss4 happily wolfed these down with a side of coleslaw and chips, and neither of them mentioned the taste of cauliflower, infact Miss 4 declared them "the yummiest, crunchiest nuggets ever!" 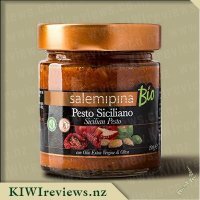 As great as these are on their own they also go amazing in pita pockets with salad, sauces and cheese and also in wraps, which create the perfect quick and easy lunch or dinner for on the go. With approximately 20 nuggets in a box there are heaps to go around, so when I had some fussy children over for dinner I cooked the remainder of these up, they loved them and their parents also loved them to when they realised i&apos;d just got there children to eat cauliflower! These nuggets are delicious, and so good for you I look forward to finding them in a supermarket near me one day soon, as they will be perfect for having on hand for Miss4 and when little people come for dinner, a product I can finally feel good about feeding to other people&apos;s children! Awesome work Smugglers!